I had the honor of being interviewed by YogaFit earlier this month in which I was able to talk about my trauma-informed yoga training journey and the huge debt of gratitude I owe to YogaFit. I hope you enjoy some history on my background. I’d be happy to answer any questions you may have regarding trauma-informed yoga! I had the honor and privilege of attending the Vets Ministry roundtable: Art as Antidote to Moral Injury this past January 9. The meeting was opened with a ringing of the bells created by some of the Veterans present. It was explained to me that scrap metals were rationed during World War II to build tanks, ships, planes, and weapons. The creation of these bells was their way to “reclaim the Armistice”—to beg humanity to stop the fighting. Many of the speakers cried as they shared their art and spoke from their heart about their experiences with war. I will never forget their words. 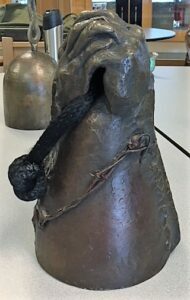 This bell was created by Chante Wolf, a dear Veteran friend who connected me with this group. Her bell is cast from a mold of her own hands clasping a warhead—her interpretation of begging humanity to stop the madness of war. This is the month of many goals and aspirations. What are yours? Please let me know! If it includes improving on a healthy lifestyle incorporating yoga, please consider my YogaLean workshop. I’d be honored to be a part of your 2018. Thank you for signing up for my newsletter. I appreciate it more than words can say. Have a great 2018!